← Does Your Gathering Technique Have You In A Tizzie? 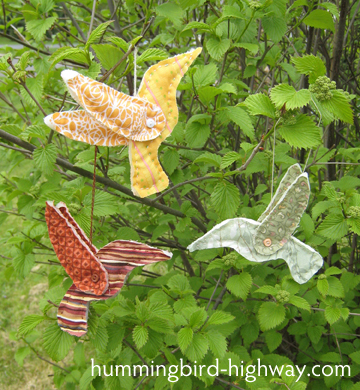 Make your very own little scrappy hummingbird ornament with two 5 inch scrap squares, some leftover batting, and embroidery or quilting thread. Start a flock or make just one! This would be a great tradition to start. You could make some for Christmas ornaments. This entry was posted in 2012, Free Patterns, Free Sites, Main. Bookmark the permalink. Thanks Chris. I just might try this with some of the scraps from your great giveaway box. Chris, thanks for sharing. I love hummingbirds, so does my mom. Think I’ll make us a few. I made two of these today.. VERY EASY!